*The authors declare that no conflict of interest exists. efficacy of TAC [8,9] and minimize toxicity [10,11]. and accumulation of biliary compounds in the body . the control of TAC concentration in TDM. possible strategy to improve efficacy and reduce toxicity. 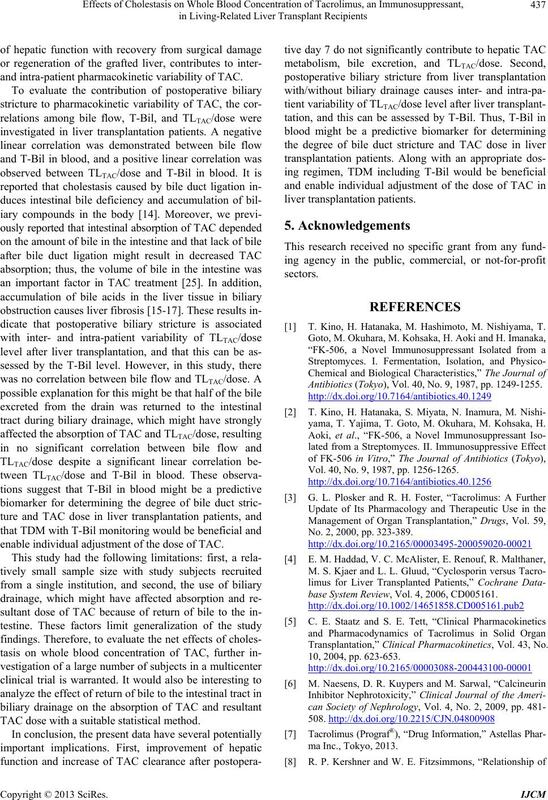 tration was investigated in liver transplant recipients. bile after liver transplantation with biliary drainage. chased from Sigma-Aldrich Co. (Steinheim, Germany). analytical grade and used without further purification. Kyoto Prefectural University of Medicine, Kyoto, Japan. (ESI) mode. CyA was used as the internal standard. ODS (2.1 mm × 150 mm, 5 μm; Chemco Scientific Co.
Ltd., Osaka, Japan) maintained at 60˚C for all separations. tate/acetonitrile (10:90 v/v) at a flow rate of 0.2 mL/min. was injected into the LC-MS/MS system for analysis. 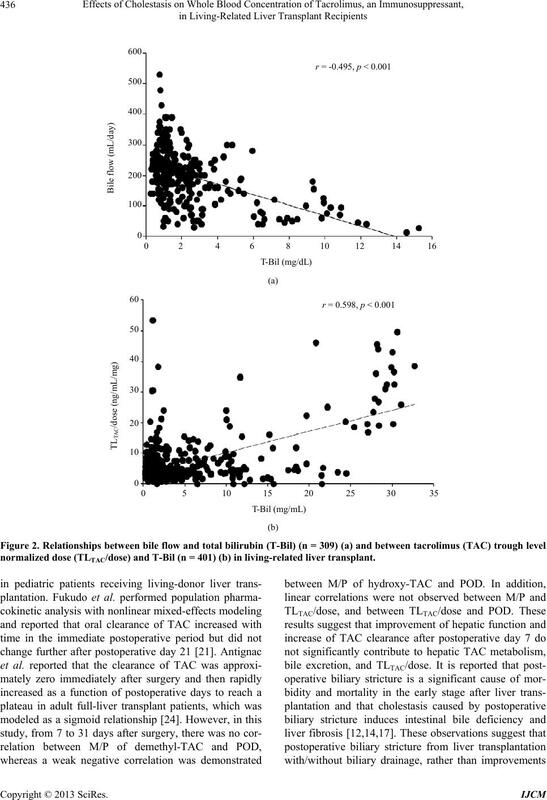 cally significant when p < 0.05.
ture and TAC dose in liver transplantation patients. = 421) (c) in living-related liver transplant patients. 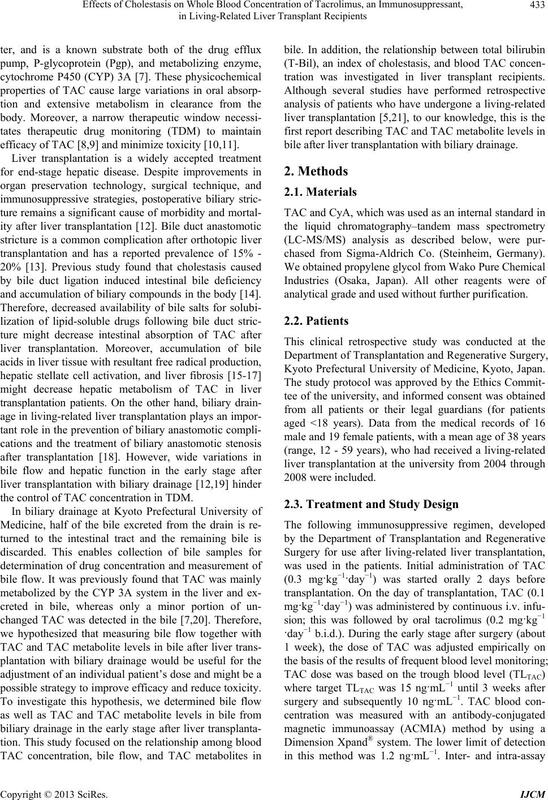 normalized dose (TLTAC/dose) and T-Bil (n = 401) (b) in living-related liver transplant. 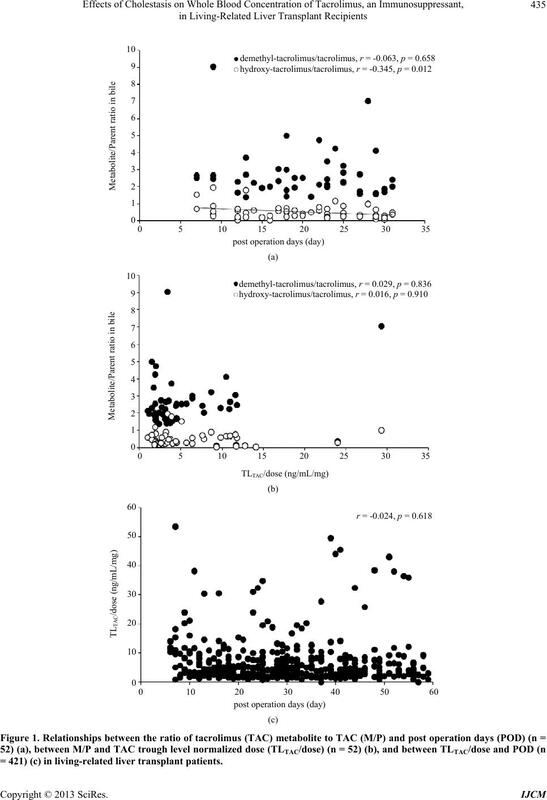 and intra-patient pharmacokinetic variability of TAC. enable individual adjustment of the dose of TAC. 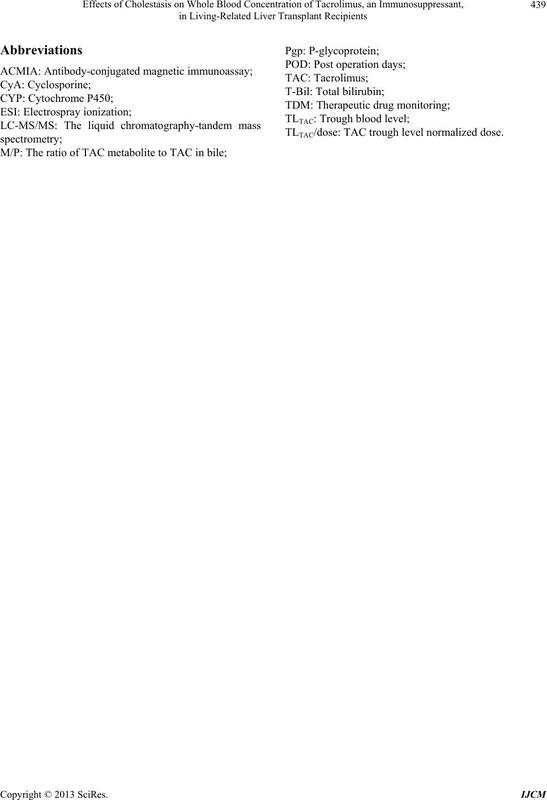 TAC dose with a suitable statistical method. 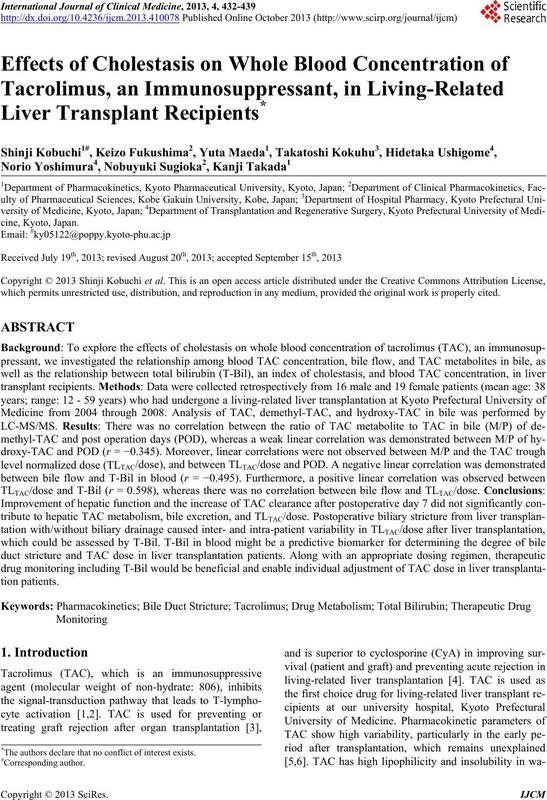 T. Kino, H. Hatanaka, M. Hashimoto, M. Nishiyama, T.
Antibiotics (Tokyo), Vol. 40, No. 9, 1987, pp. 1249-1255.
yama, T. Yajima, T. Goto, M. Okuhara, M. Kohsaka, H.
Vol. 40, No. 9, 1987, pp. 1256-1265. No. 2, 2000, pp. 323-389.
base System Review, Vol. 4, 2006, CD005161. 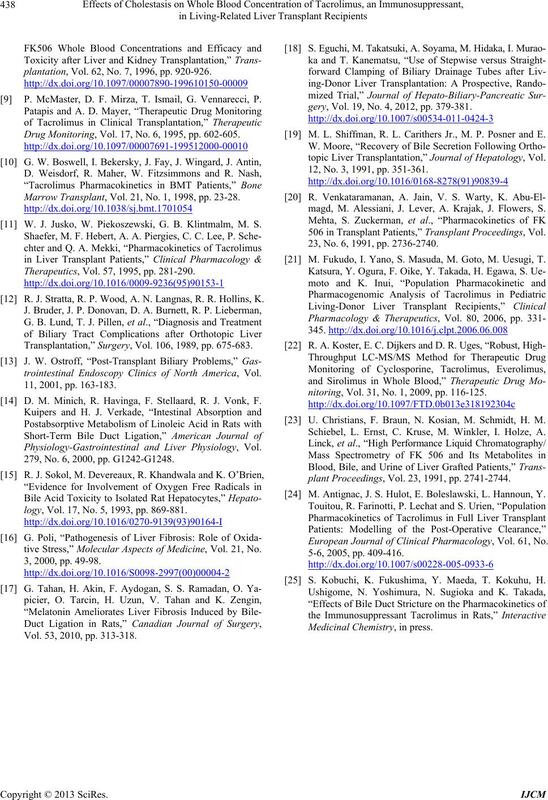 Transplantation,” Clinical Pharmacokinetics, Vol. 43, No. plantation, Vol. 62, No. 7, 1996, pp. 920-926. P. McMaster, D. F. Mirza, T. Ismail, G. Vennarecci, P.
Drug Monitoring, Vol. 17, No. 6, 1995, pp. 602-605. Marrow Transplant, Vol. 21, No. 1, 1998, pp. 23-28. W. J. Jusko, W. Piekoszewski, G. B. Klintmalm, M. S.
Therapeutics, Vol. 57, 1995, pp. 281-290. R. J. Stratta, R. P. Wood, A. N. Langnas, R. R. Hollins, K.
Transplantation,” Surgery, Vol. 106, 1989, pp. 675-683.
trointestinal Endoscopy Clinics of North America, Vol. D. M. Minich, R. Havinga, F. Stellaard, R. J. Vonk, F.
Physiology-Gastrointestinal and Liver Physiology, Vol. 279, No. 6, 2000, pp. G1242-G1248. logy, Vol. 17, No. 5, 1993, pp. 869-881.
tive Stress,” Molecular Aspects of Medicine, Vol. 21, No. Vol. 53, 2010, pp. 313-318.
gery, Vol. 19, No. 4, 2012, pp. 379-381. M. L. Shiffman, R. L. Carithers Jr., M. P. Posner and E.
topic Liver Transplantation,” Journal of Hepatology, Vol. 12, No. 3, 1991, pp. 351-361.
magd, M. Alessiani, J. Lever, A. Krajak, J. Flowers, S.
506 in Transplant Patients,” Transplant Proceedings, Vol. 23, No. 6, 1991, pp. 2736-2740. M. Fukudo, I. Yano, S. Masuda, M. Goto, M. Uesugi, T.
nitoring, Vol. 31, No. 1, 2009, pp. 116-125. U. Christians, F. Braun, N. Kosian, M. Schmidt, H. M.
Schiebel, L. Ernst, C. Kruse, M. Winkler, I. Holze, A.
plant Proceedings, Vol. 23, 1991, pp. 2741-2744. M. Antignac, J. S. Hulot, E. Boleslawski, L. Hannoun, Y.
European Journal of Clinical Pharmacology, Vol. 61, No. 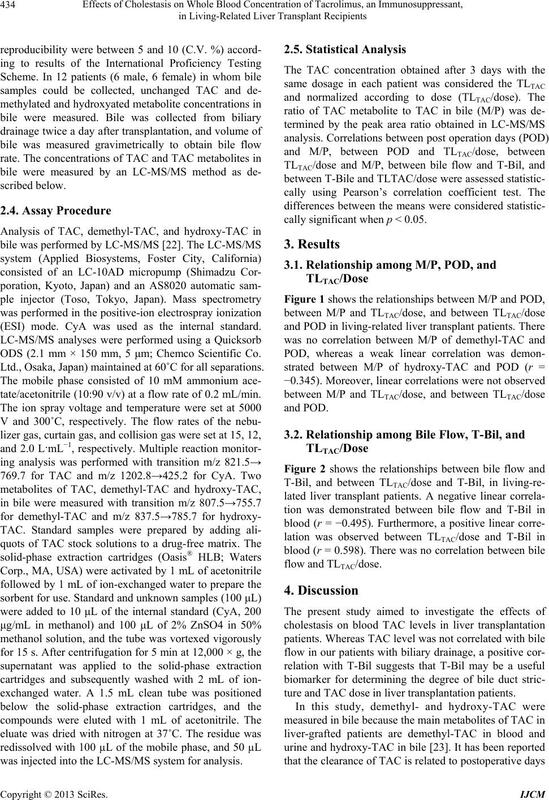 S. Kobuchi, K. Fukushima, Y. Maeda, T. Kokuhu, H.
TLTAC/dose: TAC trough level normalized dose.